I’m finding it hard to speak about, but yesterday was the Aylburton Horticultural Show and despite my best jam-making efforts, I came away empty handed. 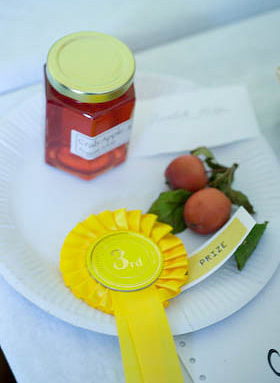 Last year at least my jam entry, of crab apple jelly, won a 3rd prize rosette, but this time round I didn’t even manage that. I am trying to be brave about it and keep saying to myself ‘it is the taking part that matters’ bla di bla… Of course that is true and my disappointment does not make the event any less charming. The trouble is that I have not come away with any idea of what to do differently next time. The laid back nature of our show means that there are seemingly no hard and fast standards to adhere too and no feedback either to learn from. Next year I will be as much in the dark as this, regarding what to enter, but thankfully time is a great healer, as they say…. Last year my crab apple jelly was clear as a bell and a wonderful colour. The taste was nice but no more than you’d expect. Some slightly more unusual preserves seemed to have done well; category 49 (chutney) was won by pear ketchup and the category 46 (jam) by blueberry jam for the second year running, so I surmised that it wasn’t necessary to be totally straight-laced and conventional. Perhaps that is where I went wrong this time? My wild greengage and vanilla jam, with a ‘softish’ set, was perhaps a step too far. Anyhow, I shan’t bang on about it or bring the subject up again, until next year by which time my angst will be a distant memory. Everyone was saying that this years show was the best ever. 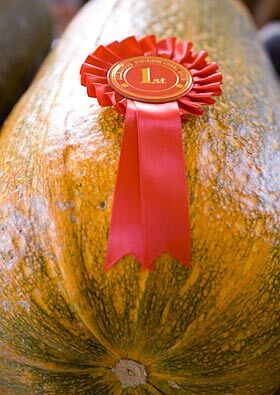 There seem to be more entries year on year and the calibre of the produce gets better and better. 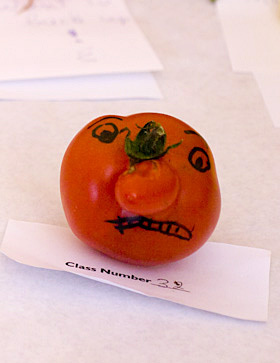 I always love the funny-looking veg category and the childrens, ‘make veg into a creature’, category. The highlight for me was a potato wearing a bobble cap, which made me laugh out loud, which was a good thing under the circumstances. 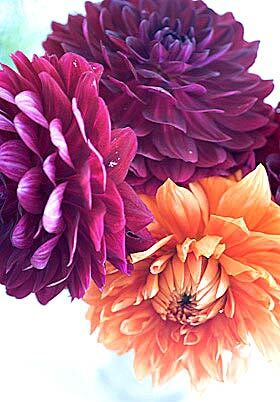 The cut flowers were utterly lovely and it was nice to see that traditional show blooms, such as dahlias, have moved with the times, shown in beautiful shades of deep red, sharp orange and shocking pink. My neighbour, Jane, whose Country Bunches I have written about before, of course scooped a first for her mixed bunch, as did her eggs, which she told me could not have been any fresher. She had waited for the eggs to be laid that morning, moments before bringing them along to the village hall. Her attention to detail stood her in good staid and for another year, the ‘eggs for sale’ sign on her front gate can claim the added caveat, ‘award winning’. It is a joy to photograph the entries and as our village show isn’t so uptight as others I’ve come across, the pictures do, I think, capture the idiosyncratic nature of English village life. You can see more pictures here. Here at Taurus, an annual fire sculpture event has become a much anticipated part of the events calendar. 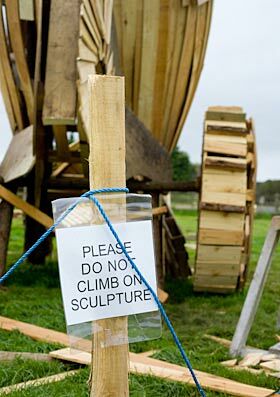 Each summer for the last 10 years, a giant wooden sculpture has been constructed on the front lawn, following a chosen theme and culminating in an evening of ritualistic revellery and the sculpture being set alight. Last year the theme was the Severn Boar, which referred not only to the wild boars that are sighted from time to time in the Forest of Dean but also the famous River Severn tidal wave (spelt Bore) that keen surfers like to ride and that runs close to Taurus. Round here, never a week goes by without a report in the local paper to the effect that someone’s dog has been chased by a boar or someone’s child was chased by a boar or someone was scared out of their skin by a boar. This years event, Shoot The Moon, is celebrating the 40th anniversary of the moon landing, when man first stepped foot on the moon. I know it may be sounding more than a little ambitious, but the intention is to send someone to walk in Neil Armstrong’s footprints. 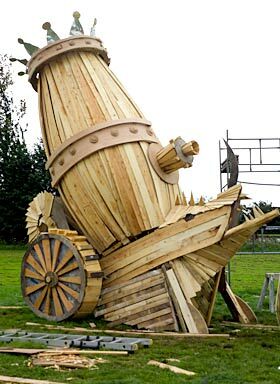 A sixteen foot high wooden circus cannon is being built as we speak and on Saturday night the foolhardy crew plan to climb inside it, the fuse will be lit, and said crew will be propelled out of the stratosphere. In true circus style there will be a big circus build up and considerable razamatazz helped by musicians, pyrotechnicians and projectionists. 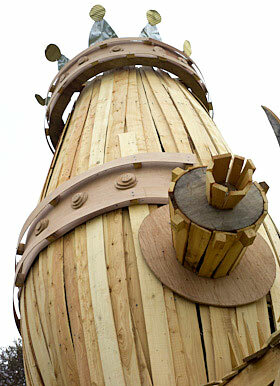 Steve Hyslop is building the sculpture and can add ‘human cannonball’ to his CV. ‘I like the mechanical, rather kitch image of the fat circus cannon. It’s comic rather than threatening, with an element of anarchy,’ says Steve. He and co-conspirator Damon Bramley will thankfully be donning safety gear for their heavenly mission. 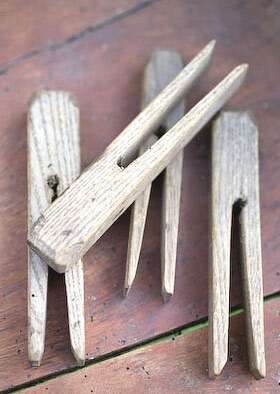 I was really pleased with the photographs of my old pegs that I posted a few weeks ago. Since then I’ve acquired even more. 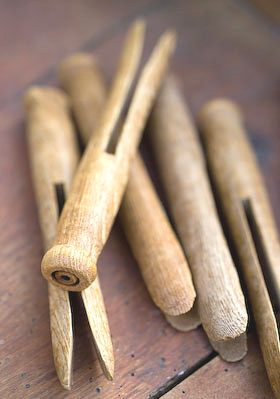 It is hard to believe that pegs could come in so many different styles, but the fact that they are all handmade by someone, once, and designed to do a necessary job makes them especially interesting to me. I don’t suppose they were ever considered as things to warrant attention. The first set of pegs are quite large. 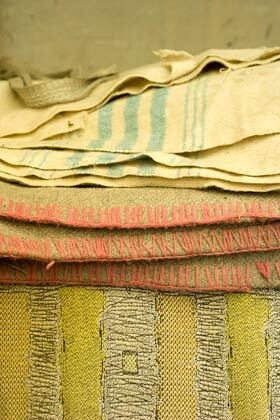 They have been turned on a lathe as there are marks in the tops which show where they were attached for turning. I think they are oak but seem to have been stained to give them a rich woody colour. The second set are again quite big, clumsy and chunky, hewn from untreated oak. The tops are square and have been thoughtfully bevelled at the corners, to make them more comfortable to handle when being pushed down onto the washing line. The last set look like conventional dolly pegs but, though my photo doesn’t really convey it, they are child sized, each peg only 6cm long. They are like the first pegs given to me as a child by my Aunt Lily, who always gave the best presents and had an innate sense for what you’d want more than anything in the world. 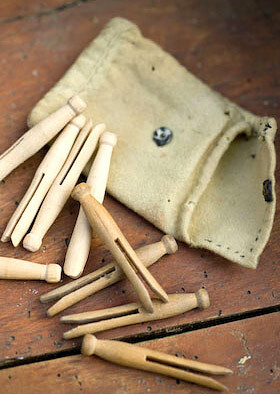 Whoever owned these little pegs hand stitched a flannel bag to keep them in. Small nimble fingers sewed on a press stud fastening to keep the pegs safe and tidy. 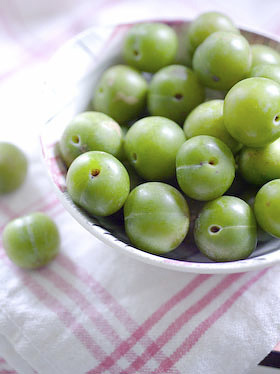 Greengages have always been a mystery to me, my only experience of them being when I was at primary school and for a fleeting moment you could get Penny Arrows in greengage flavour. For anyone unfamiliar with this retro confection, it was a strap of flavoured toffee available from the ‘penny tray’ in the sweet shop on the way home. Plain toffee was the regular flavour but they introduced others from time to time for short runs. I could just about cope with butterscotch, or even banana flavoured Penny Arrows but greengage was a step too far, quite weird and highly scented. That was my first taste of what I thought was the flavour of greengage and it very nearly scarred me for life. The other day, Irene, my neighbour, asked me if I could take some greengages off her hands, as she wasn’t able to use all the ones she had been given. Of course, I jumped at the opportunity and promptly received a small bag full of washed and sorted fruit. With the Aylburton village horticultural show now only a week away I’ve been busy all week trying to cook up what will hopefully be a prize winner for the show. These greengages, apparently a wild cultivar, were very small and round, each fruit no bigger than 3cm in diameter and there was 650g of fruit. I decided to add just vanilla and sugar. I sniffed the fruits to see if they bore any resemblance to the Penny Arrows of my youth and thankfully they didn’t. This wasn’t a lot of fruit to play with and I could have done with using a smaller pan than my preserving pan, as the bubbling syrup almost burnt during the rolling boil stage, so the recipe that follows has been doubled up to a more manageable quantity. Cooked greengages are rather odd, the flesh an unattractive shade of slimy yellowish green and the skins go brown as they cook. Wanting the jam to have a good appearance for the village show, I made the decision to put the cooked fruit through my trusty and much loved food mill to give a better looking result. Jam made this way does still have some texture but the overall appearance is even and foamy. It makes a jam that is very easy to eat but you can leave the stones and skins in if you prefer for a more textured whole fruit in syrup finish. I have to say, the finished product is absolutely wow, still slightly tart, zingy, sherberty and packed with flavour. I don’t know whether larger cultivated fruits would make a jam quite this fabulous, I’m on the look out for some to compare. If you can find the fruit, do give this recipe a go. Choose ripe to slightly underripe fruit, washed and sorted and place in a pan with the vanilla pods and 3 tablespoons of water. Cook gently to start the juices flowing, adding more water if necessary to stop the fruit catching on the bottom of the pan. Simmer gently until the fruit is cooked through and juicy, approximately 10 – 15 minutes. 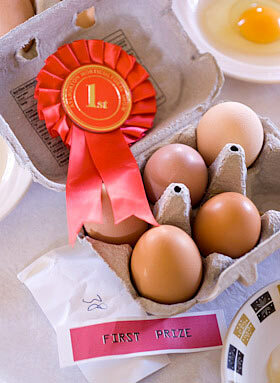 Remove from the heat, cover the pan and set aside in a cool place for between 12-24 hours. The fruits will have split during cooking. With clean, washed hands fish around amongst the fruit and remove all the stones and the vanilla pods. Force the fruit through a food mill or a sieve so the skins are left in the food mill and you end up with a bowl of funny looking puree! Weigh it. You should have approximately 870g. You can match this amount with sugar but I prefer to use less, so I used 85-90% sugar to fruit = 780g sugar. 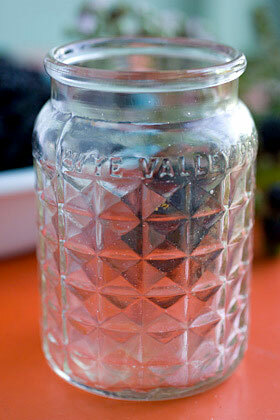 Put the sugar in a bowl in the oven to warm along with the clean dry jars. Split the vanilla pods and scrape out the seeds. Place them and the pods back in the puree and warm through before adding the sugar. Keep stirring until the sugar has completely dissolved, then turn up the heat and boil until the jam reaches setting point, keeping an eye on it to be sure it doesn’t burn. (Test a splodge of jam on a cold plate or use a jam thermometer for this. Refer to my book if you haven’t done this before.) It only took about 5 minutes to boil the syrup to a softish set, so do watch that you don’t cook too fiercely or the jam will burn. If you cook it on further you will be able to achieve a thicker set more like a fruit butter or cheese. Take care removing the pods then pour into jars and seal. Label when cold. I thought I would post some pictures of the wild damsons I found growing by the roadside in the heart of the forest. I really must remember to keep a set of step ladders in the car for such eventualities, as there is always fruit just out of arms reach that you have to come to terms with giving up on. When I got home a neighbour had left a bag of plums hanging on the door handle of the front door. I’m not sure who, but I suspect it was Helen and Steve (at the end) who two days ago passed by as I wobbled about on the top of a stone wall, picking more damsons from a tree overhanging the road. 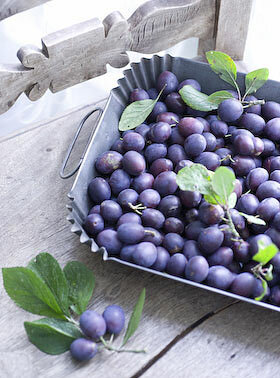 Those damsons were growing in someones garden and are larger than the wild ones I found yesterday. I hasten to add I had permission to wobble about on their wall. Helen and Steve asked me if I was scrumping (is it called scrumping for plums, or does that term only apply to apple picking?). I think I may be gaining a reputation. 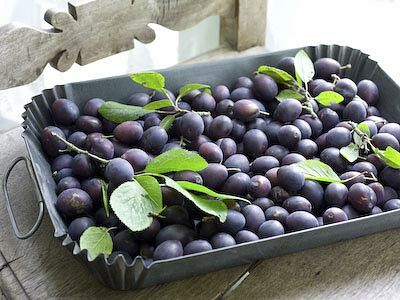 I am thrilled with my damson crop as they are just about my favourite fruit for preserving and don’t need to be used in any oity-toity combination with anything. They are just perfect on their own. I’ve just been out on a little jaunt. Feeling haunted by thoughts of a kitchen cabinet, spotted on my wanderings yesterday but not purchased at the time I decided that £5 was a snip for this modest item with original 60’s patterned formica top, and so closed the shop for an hour to go and buy it. I would most likely have saved the cost of the cupboard in petrol money if I’d bought it yesterday – such is the folly of cost cutting mind games. The cupboard was at my favourite second hand place in the forest, called Gorsty Knoll. I am in two minds as to whether I should make the name public, as I don’t really want the world and his wife trying to find it, but in a way, the name is as strange as the place, so I think it merits a mention. Basically, this second hand furniture dealer sells a load of old tatt; house clearance boxes, old cutlery that has seen better days and that was never up to much in the first place, divan beds and comfy but ugly sofas. There is always a big pile of broken furniture by the door, chairs missing a leg and bits of rusty old bedsteads. I absolutely love the place. You always feel that there is a hidden gem just waiting to be discovered and I have found a few over the years. 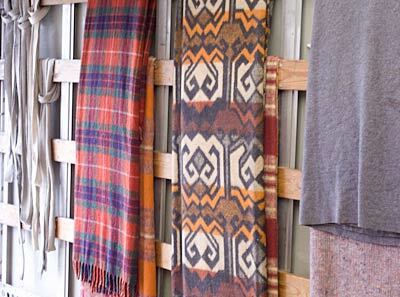 This guy doesn’t seem to bother with textiles. 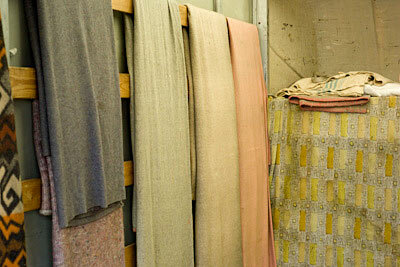 I’ve asked him before and he says that linens are usually thrown away or taken to the charity shop. 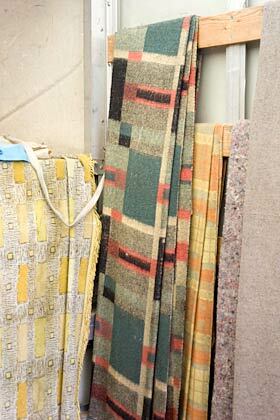 As I was leaving with my new purchase in the back of the car I caught a glimpse in the back of his van, the van he uses to do his house clearance jobs and thought how great all the blankets looked hung on the bars lining the inside. He thought I was mad when I asked if I could climb inside and take some pictures, he hadn’t ever looked at them in that way. As I drove away I realised that the road was lined with wild damson trees covered in fruit, screeched to a halt, parked up pronto and filled a bag with them. What a flippin’ fab day out. The village fruit and veg show is only 2 weeks away, so I need to get my skates on. Last year I managed a 3rd prize for my crab apple jelly and a second prize for my damson chutney and I would love to do better this time round. As my book came out earlier this year, I now feel I have my reputation as well as fruit to preserve. The blackberries round here are particularly plump and abundant this year. Last year I did manage to gather some but each berry was small with not a lot of juice. This year it is a very different matter. Yesterday evening I went out to pick some, along with my cat Beau. He wasn’t any help but did bring a certain cute factor to the proceedings. I managed to harvest a large plastic box full in a very short time and as it is still early in the season, I know there will be lots more fruit to come over the next few weeks. The plan, to make blackberry and nectarine jam, as I picked up some nectarines in the supermarket this week, reduced with yellow labels! (I have become the yellow label queen). I made this preserve for the book and it was a great success. In the recipe it does have added spices in the form of star anise, cloves and cinnamon, but I’m going to forgo the spiced approach and hope the fruit flavours are tasty enough to stand alone. I do love using nectarines in jams as they have a lovely acidic flavour. There are elderberries almost ready to pick here, so blackberry and elderberry jam is the next jam I’m planning. 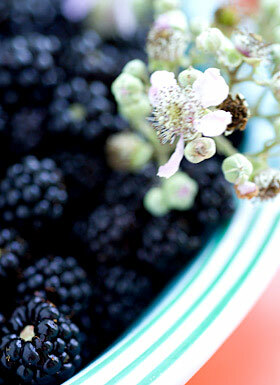 I love the idea of using two foraged-for-free fruits together. Plum and elderberry, again there are lots of plums up for grabs on the trees a mere hop skip and a jump from my front door so it seems a shame not to use them up pronto. Rhubarb and apricot jam, another real star from the book and fast becoming my signature jam, if you can have such a thing. My neighbours rhubarb keeps on coming and I’ve bought some French apricots, as I don’t grow them myself or know anyone with some to spare. So that’s it for starters. Next week is going to be a busy week. If you find an empty jam jar exciting, you are a very lucky person indeed. It surely means that you can appreciate the simple things in life that make just living a rich experience. Well that’s my theory anyway. 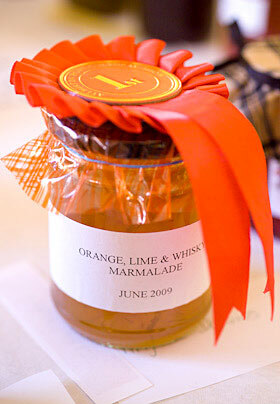 I’ve been working on how I want my own range of preserves to look, that I intend to sell here at The Laundry. The range will be called Glut Kitchen and I’ve been looking for the right jars and lids to use as well as thinking about the feel that I want the branding to create. This is all before any jam gets made. Once you start thinking in this way you realise the limitations. It isn’t a matter of finding the loveliest jar you can, as you can bet your life it will be far to expensive and impractical to use, making the end price for a jar of jam way over the top. I thought you might like to see this vintage jar I recently acquired. It isn’t French this time, it’s British. Yes once upon a time we made such things and did a great job of it. 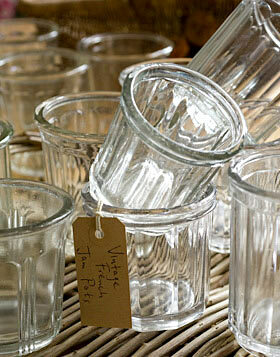 Not only does it have a nice faceted pattern around the sides but it says ‘Wye Valley Preserves’ around the rim. The jars I choose for my own range wont be anything like as fancy as this and I doubt that in years to come someone will be waxing lyrical about an old Glut Kitchen jar, but fingers crossed they will remember the taste of the jam it contained. laundry etc is © Gloria Nicol / The Laundry. Benevolence theme by Theron Parlin.